Dirty Devil River Camp is windy. I parked so the wind strikes the BLT at the back. 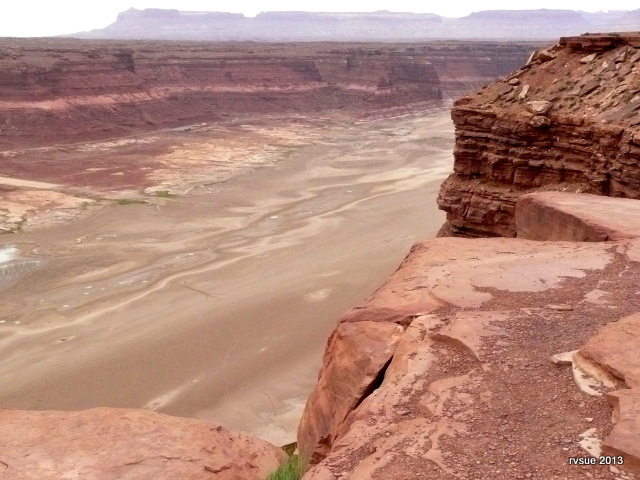 All night long the wind increases, howling and nudging the Best Little Trailer on her perch above the wide canyon through which the Dirty Devil River meanders. 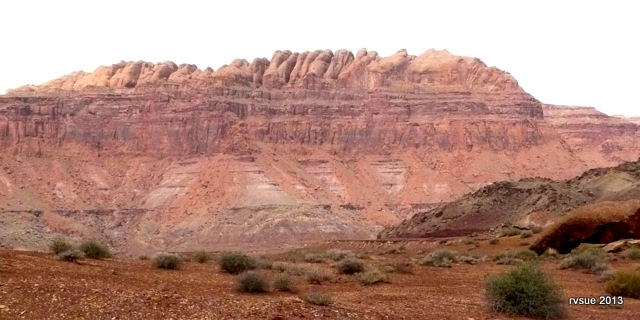 The first morning of our camp here, Friday, May 17, the crew and I play on the slickrock. All the while I’m evaluating the cloudy sky and the nature of the warm and constant wind. It’s not my practice to tow in wind. This is different. This wind isn’t just passing through. It lives here. My hunch is, once we’re away from these massive cliff walls, the wind will die down. Since I didn’t unhitch the night before, it’s not long before we’re on the road. 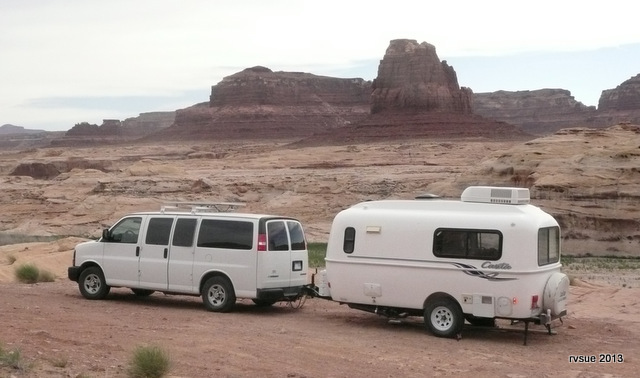 A short distance from camp, we turn off Highway 95 to drive up to Hite Overlook. From this viewpoint I can see last night’s Dirty Devil River Camp. 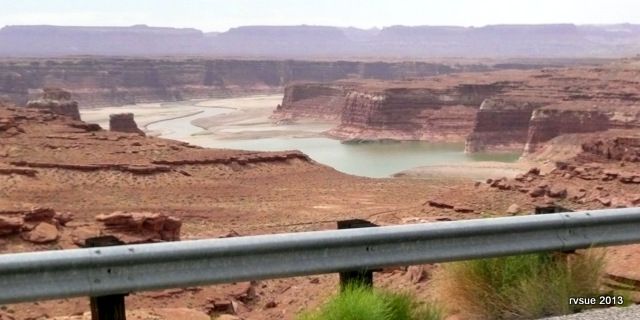 Highway 95 from Hite to Hanksville is known as The Trail of the Ancients Scenic Byway. 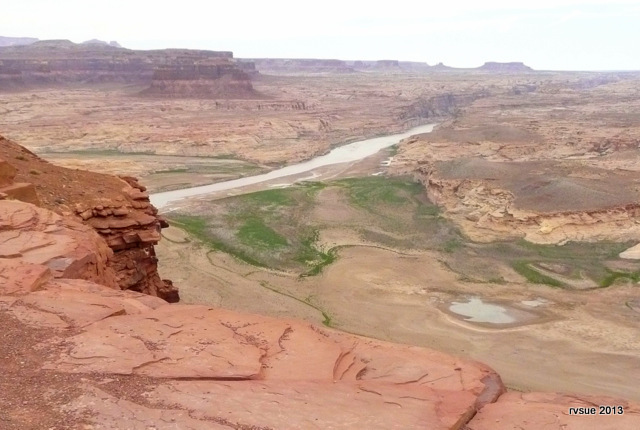 I get a glimpse of some water flowing into Lake Powell and soon we leave the Glen Canyon Recreation Area. 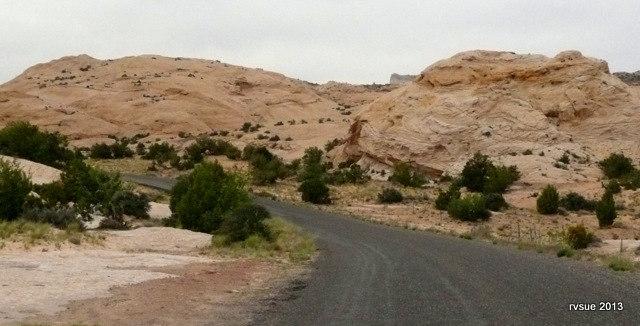 The road winds through rock cliffs with scant shoulder which makes photos difficult. I put down the camera and enjoy the ride as we roll along. Bridget and Spike are asleep behind me. The wind is slight and not noticeable when driving. Around noon we reach Hanksville. I stop at the Chevron station and buy gas and propane. I notice a short cell tower on the rocky hill across the road. I walk the crew around, toss them back into the PTV, open up the laptop, turn on the Mifi aircard, and answer some comments on this blog. Before pulling out, I buy a chocolate milkshake at The Burger Shak. I don’t eat burgers. There’s nothing easy to fix for lunch in the BLT. And I haven’t had a chocolate milkshake in decades. No kidding. It’s a darn good milkshake and sets me up for the next leg of today’s travel. Okay, I need to make a decision. 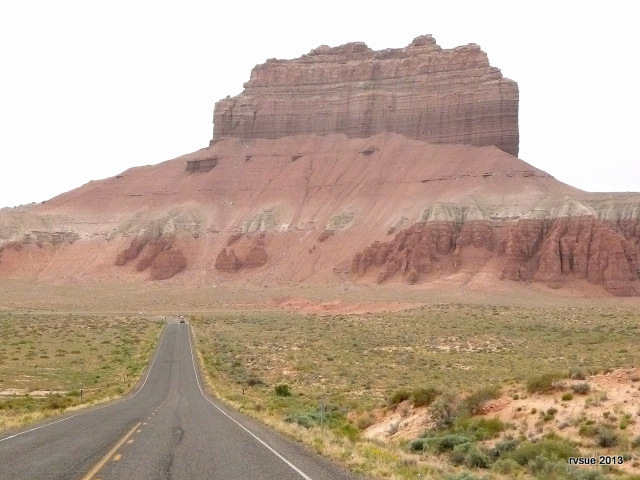 I can turn west and go through Capitol Reef or I can continue northward to Goblin Valley State Park. I choose the goblins! 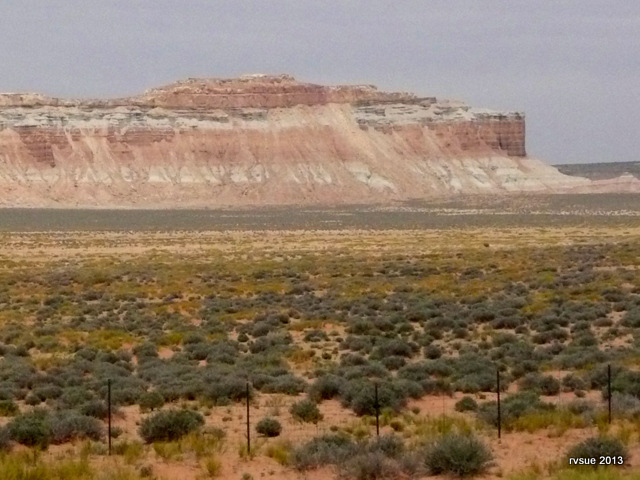 Beyond the irrigated green fields of Hanksville, the landscape changes to flat desert pocked with sagebrush. The Lower Blue Hills lightly touched with snow serve as a backdrop. 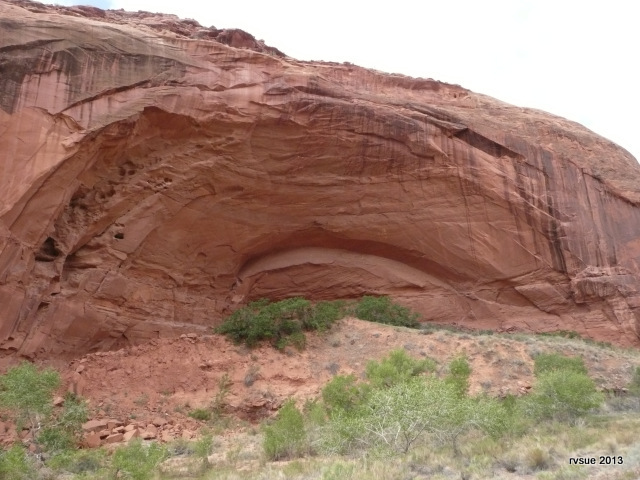 We pass Big Wild Horse Mesa on the left. 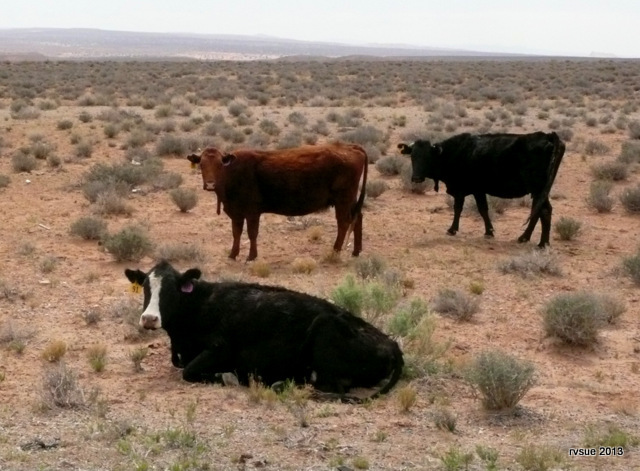 To the right the San Rafael Desert stretches in a seemingly endless plain of sagebrush where cattle roam in free range. 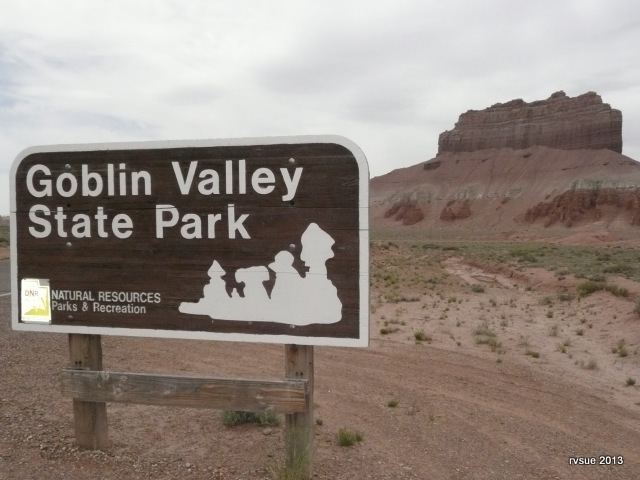 After about twenty miles I turn left toward Goblin Valley State Park. An information kiosk appears at a turn-out. A large map of the area is pinned to the bulletin board. The San Rafael Reef is ahead and apparently, given the information on the board, it’s a popular place for hikers, climbers, and OHVers. I make another left turn onto the road to the park’s entrance. Oh boy. It’ll be good to stop for the day and relax. I’m getting tired. I’ll set up in a campsite, take it easy for a bit, walk the crew around the campground . . . I drive up to the entrance gate. An ominous sign on the toll booth states Campground Full. I ask the lady in the booth if it’s possible a site has opened up. Cheerfully she tells me to go back to the info kiosk, turn left and I’ll find a BLM fenced-in area with vault toilets. This I do and find it totally unacceptable. Flat, red dirt. Welcome to Camp Ugly. I continue down the road leading into a canyon. My heart skips a beat as I approach beautiful campsites. Then my spirits drop. 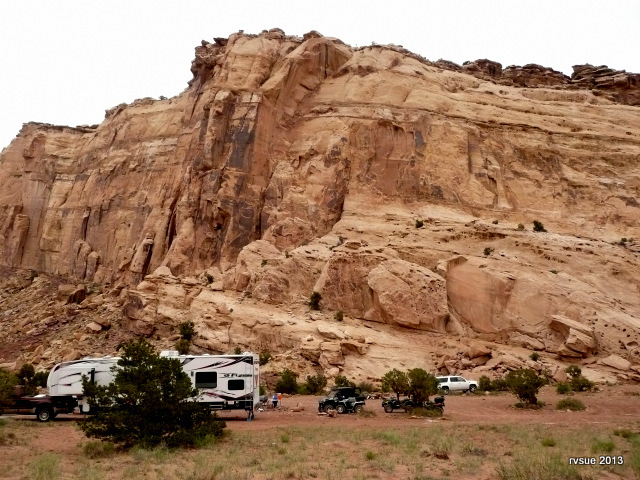 Every gorgeous campsite has a toy-hauler or trailer with one to three Off Highway Vehicles. I turn around at the first chance and drive back out of the canyon. Well, whaddya expect. It’s Friday afternoon and time for weekend off-road roaring and racing! Gee, this is quite a challenge. 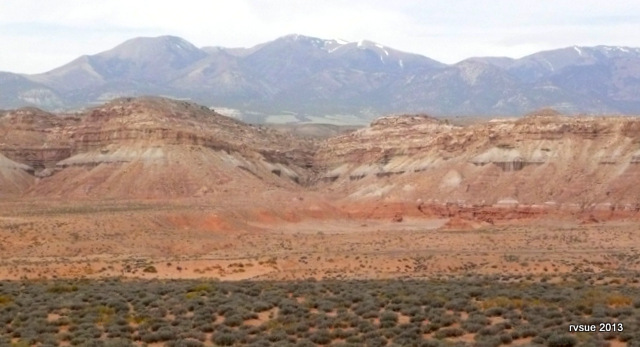 I don’t want to camp on a sagebrush plain and I don’t want to get caught in a narrow canyon with no way to turn around. My next post I’ll tell how I found a lovely, quiet boondock in an unfamiliar, challenging area and without the help of the internet!